In Community, Design, Featured, Why Permaculture? To get caught up and find out why Lyme disease is spreading like oil spilled in the Gulf of Mexico, check out Part I. We’ll all wait for you. We’re nice. So, reason number three why Lyme disease is rampant: us. It’s not us so much as our current form of interacting with the world. We deforest huge tracts of land, reduce the habitat and diversity, kill off the large predators, and live closer to those snuggly-wuggly animals. Then we fixate on the “big threats”, like grizzly bears, tornadoes, and the sky falling. After all, it’s common knowledge that we’re immune to such paltry things as disease, energy cost fluctuations, and, for those of you who would be disappointed if I didn’t mention it, Michael Bay films. By reducing all landscapes to a single type of plant and wiping out all those mean predators, we create a habitat that is great for only a handful of animals. This is not an ideal way of creating healthy landscapes, animals, and people. A nice, ripe White Tail deer is often the final meal a female tick has before carpet bombing the planet with thousands of hellish offspring. Researchers can predict where the next surge in the tick population will be by following deer. (More deer = more nutrients for tick nooky.) Deer also travel a long way, navigating the prairies like a furry Mayflower, depositing disease-ridden colonists wherever they go. Much like the actual Mayflower, come to think of it. Courtesy of the lovely and multi-talented Lindsey Kemlo. Predators of all kinds find deer tasty. Their role in the world is to keep the deer population healthy and at reasonable levels, among other things. Human attitudes towards the big, bad predators have helped shape and intensify the tick problem by ensuring an ever-present bumper crop of deer. Wear light-coloured clothing when you’re out roaming in tick country. Ticks aren’t built like mosquitoes. They can’t just puncture through clothing and into the skin. Their whole strategy involves getting to bare skin undetected, so you’ll notice their dark bodies on a light backdrop while they crawl around looking for a way in. Bonus points for wearing long pants and tucking them into your boots or socks. This is also a stylish approach to outdoor living. The single most effective thing you can do to avoid Lyme disease is performing tick checks. Once a tick is attached it will stay that way for days while it feeds. (They believe in savouring meals.) It takes Lyme disease about 24 hours to transfer from the tick to the host, so finding and properly removing the tick as soon as possible can be all it takes to keep from getting infected. It’s also important to harvest these ticks for testing so we know how many are carrying what diseases and in what areas. Do a tick check every time you get back to your home or camp or mothership. It’s easy: strip down to your ape suit and check along your skin for any little bumps. You’re not looking for a whole tick; only their abdomen will be visible (like this). Keep in mind that ticks prefer devouring in calm, so any fold of skin is a likely hiding place. Belly buttons, groins, and behind ears are all favorites. One cannot stress enough the power of pairs. Humans are the only apes that don’t groom each other, which leaves us at a disadvantage when dealing with parasites that feed attached to our skin. Many couples who do this get into the shower after an excursion and look each other over while washing, allowing for visual and tactile examination. And there’s nothing more romantic than a lantern-lit tick check while freezing your respective butts off in a nylon tent. Never, ever, ever use fire, pointy objects, or anything else to threaten an attached tick. They are just as likely to burrow deeper as they are to back out. The only known safe way to remove a tick is to use tweezers (or a specialized tick removal tool) to grab the critter as close to the mouth parts as possible and pull it straight out. 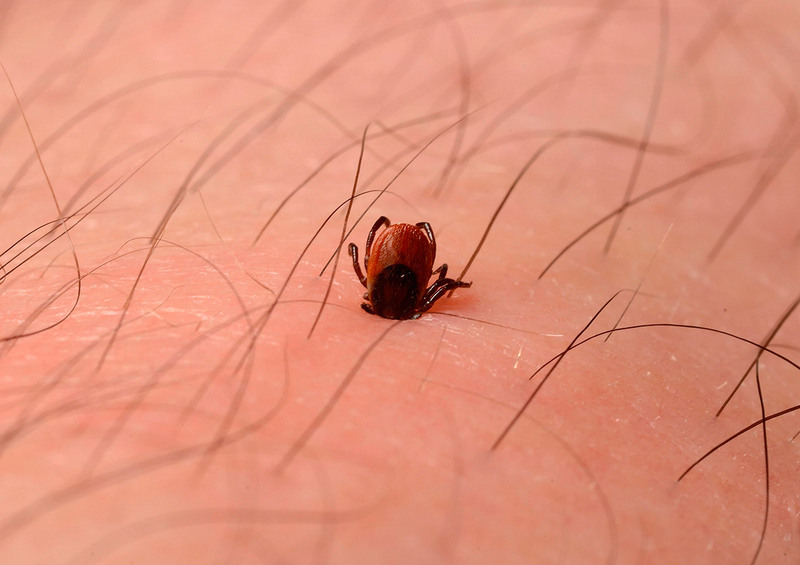 Note that squeezing a tick’s body can cause it to regurgitate, which increases risk of infection substantially. Don’t build or buy a house that’s in the type of suburbia with isolated forests abutting your property. These forests, devoid of predators, are perfect for mice and other rodents, thus giving ticks an endless supply of morsels to keep their life cycle going. We all want to live nestled in bear-free woodlands with Ewoks frolicking about, but this is one of the exact patterns that has helped Connecticut earn sky-high rates of Lyme disease. Birds carry lots of ticks from all over the place, so resist the urge to turn your yard into a landing strip for invading disease vectors. Birds can find their own food in the flush of spring and summer, which is when most people hang a feeder next to their door and when most ticks are looking to hitch a ride and get freaky with each other. Put out feeders only when there’s a dearth of forage, namely the colder months. This is when birds need the most help and ticks are less likely to go far. Design your landscape and structures right the first time. You could, for example, create an integrative ecology using something like, I don’t know, Permaculture. If only there was a blog post out there that combines Permaculture with Lyme disease mitigation. I guess we’ll have to wait and hope somebody writes one in the near future. Semi-patiently awaiting the arrival of said blog post that combines Permaculture with Lyme disease mitigation. Well, I agree that ticks are a growing problem, and with them, the possibility of Lyme Disease, and the article had some good points, like don’t poke them. But why all the useless stuff, like what does Michael Bay, whoever he is, have to do with Lyme disease? And why do you have to insult the Mayflower Colonists? Last time the reader was insulted, so I do wonder who will be insulted in Chapter 3? Or is it possible, I wonder, to write without (gasp) insulting anyone? And I disagree that climate change is a cause of increasing tick numbers, tho u can blame urbanization and less guns and hunters. The deer pop has increased since there are less farms, and less people shooting deer, along with vastly improved deer habitat – little disturbance and grain conveniently delivered in grain bags, just down the block. Also, will the next chapter mention that, at least in Sask, not sure about AB, we mostly have American or dog ticks, rust in colour, which do not carry Lyme disease like the black leg ticks do, tho the migratory birds carry the black leg ticks so Lyme disease is here too. Also, that guinea fowl, and to some extent, chickens, eat lots of ticks (and that they make a very satisfying popping sound (or is it a ticking sound) when burned with a match or candle). I do not find Justin’s writing style for this insulting, but entertaining. Anyone can write an essay on ticks. Even though I have done some reading on ticks and Lyme I haven’t picked up a lot of knowledge from doing so. This series has helped me keep some things in mind with humorous visuals. But it aint pizza, can’t please everyone. Some people are more sensitive than others. You’re absolutely right about humans as predators. We’re just as much a part of the ecosystem as any furry apex predator, and our decreasing predation activity is definitely making an impact. And, as touched on above and honed by you, the habitats we’ve created are a great deal for certain animals. (The irony is that there’s a good chance I contracted Lyme disease while hunting Mule deer). You’re also right that it’s not fair to blame the Mayflower colonists for spreading smallpox in the New World. The English slavers who came a few years prior started that epidemic. Unwittingly. I figure a deer covered in ticks is similar. Regarding the unwitting spread of disease I mean. Not the slavery. 1. Nymphs typically hibernate through the winter, coming out to feed, moult, and reproduce when temperatures get warm enough to “quest” (hitch a ride and grab a meal). 2. Adult ticks do not hibernate, but can’t quest below about seven degrees Celsius. 4. Nymphs usually come out of hibernation right before the newest larvae hatch. This gives opportunity for the nymphs to pass disease along to new reservoir hosts, and ultimately the next generation of li’l whipper-snappers coming behind them. 5. If the previous winter was warm, the nymphs get a big head start on both transmitting disease and procreating. All of these things, and others, extend and accelerate the tick life cycle. There are more ticks, and each tick can be active for longer. Most human Lyme infections still occur in the height of summer, but that is also due to the fact that humans are more likely to be out and about — and in less clothing — during those times. Ticks might not mind chilling out on a leaf in the buff and waiting for food at eight or nine degrees, but humans have other needs and tastes. One relatively strong correlation that’s interesting to me is between greater precipitation and higher rates Lyme disease. There are some fascinating physiological reasons for this — in the tick I mean — but again there’s the consideration that humans don’t like to venture out when it’s blazing hot and tinder dry. Here is a simple chart I made using Environment Canada data. It shows the mean temperature of Calgary in January (our coldest month) from 2010-2015. This isn’t statistically sound, of course, and I will never claim that snap shots can predict long-term trends. But anywhere that shows a similar trend will see an up tick (no pun intended) in rodent and parasite populations, including our dear Lyme-carrying friends, this year or the next. Which brings us to ask what kind of ticks will increase in population. According to the Alberta Government’s tick surveillance program, ixodes (black legged/Deer ticks) ticks are not “established” in Alberta. Someone I know once showed me a tennis ball container with about 30 adult ixodes ticks inside. He found them all on a single tennis court right here in Calgary. How did they get there? It could have been a flock of unfortunate winged fellows. Maybe not. It’s anyone guess. But a survey of Borrellia (the genus of bacteria that can cause Lyme) found two distinct disease-causing species in Lone Star ticks. This is one of those types of ticks that “can’t” transmit Lyme disease. So we’ve either missed what species of tick can transmit Lyme, made a big mistake about which strains of Borrellia can infect humans, or the bacteria is mutating and finding new relationships and victims. Then there are the dozens of other bacteria, viruses, and parasites ticks carry. Part III does mention guineas. I love those little guys. They’re funny, they annihilate ticks, and they taste great. You’re the second person to mention the heat expansion method of tick disposal. The other person told me it sounds like very big Rice Crispies.